A Shaker Kitchen is a kitchen style that is distinctly minimal with a clean-lined design that has little or no decoration. Shaker Kitchen cabinet doors consist of a recessed panel and a four-piece wood frame. Most of these kitchen cabinets are constructed from wood and dovetail joints. The original Shaker Kitchens were modest due to the Shaker’s religious views. A Shaker style kitchen has simple lines and understated elegance that has stood the test of time. The cabinets have a significantly unadorned look with a focus on practical design and craftsmanship. This design style comes from a religious group’s need to create furniture from bare essentials and without embellishments. Because of its unfussiness, you can find a simple Shaker kitchen in modern, traditional, high-end and budget homes alike. The Shakers, officially The United Society of Believers in Christ’s Second Appearance, was a religious sect founded in England in 1783. They were initially part of the Quakers but broke away in the mid-18th century. The Shakers name comes from “Shaking Quakers”, which is what they were called because of their restless worship style. However, after religious persecution, the group fled to America. Equality was the cornerstone of their faith, specifically of the sexes and races, alongside pacifism and communal ownership of property. However, Shakers also practised celibacy that significantly shrunk their numbers. As a result, only two members remain today in Sabbathday Lake Shaker Village, Maine. To the Shakers, to create something with intention was a form of meditative prayer. Consequently, crafters kept to the principle that beauty rests in utility and avoided unnecessary adornment that they believed was too self-indulgent. However, they did like to dance. So, they preferred and made lightweight Shaker furniture that was easy to move around. That’s why tapered and turned legs, in particular, are characteristic of the style. Their focus on practicality allowed the Shakers to invent things that we still find useful today: the spring-loaded clothes-peg, peg rail and flat-faced broom are great examples. Check out this video from Ask the Decorater on what Shaker style is and where it came from. The resulting Shaker style was without decoration but had exquisitely detailed joinery and precision. Items were minimalist and made exclusively for their intended purpose. For this reason, Shaker kitchens came to be sleek yet unassuming. 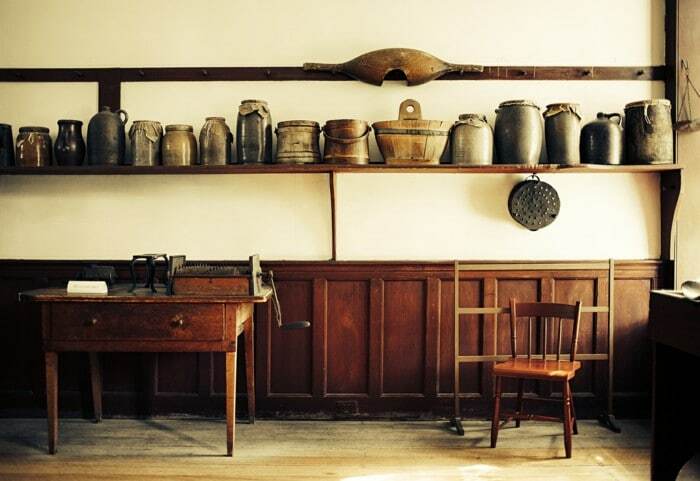 The original Shaker kitchen was crafted many decades ago but has significantly outgrown its humble beginnings. Photo galleries of Shaker kitchen designs are indeed bountiful on web searches. Popular and covetable, the Shaker name is incorporated into trade names like the Shaker Kitchen Company Limited to reach their clientele. Luckily, you certainly don’t have to look far to get the perfect Shaker kitchen cabinet doors or worry about small Shaker kitchen ideas for your tiny home: we’ve got you covered! Find the kitchen that’s perfect for your home straightaway with the click of a button. And if you need more design inspiration, have a look at our Kitchen Design Ideas section. Now that you know more about where the style comes from, it’s time to find out more about shaker kitchen cabinet doors and shaker style kitchen units. Many interior lovers turn to sleeker, simplified kitchens which truly make Shaker style a clear favourite. Traditionally, Shaker kitchens were made from best but least expensive wood available. Fruit tree or pine was often used in their furniture, resulting in the quintessential light-wood look. However, present-day Shaker cabinet kitchen designs can incorporate mixed new material and almost any wood type. The Shaker kitchen doors are without adornment, consisting only of the four wide frame pieces with a flat panel in the middle. The frame is constructed with traditional dovetail joints that hark back to its humble origins. While the original kitchen doors would have been treated with oil only to retain its natural look, modern Shaker kitchen cabinets are also stained or painted. Shaker kitchen cabinet colours are as varied as the rainbow. Depending on the rest of your interior, unfinished shaker kitchen cabinets can be bold and contemporary or traditional and minimalist to suit any style. The pulls and handles of shaker kitchen drawers and cabinets were traditionally made from the same wood as the rest of the unit because metal versions were seen as too elaborate. So, to mimic the original look of a Shaker style kitchen cabinet design, stick with minimal and humble pulls as they look best on Shaker cabinets. The simple lines of the cabinetry mean that it can easily complement any style of kitchen. Here are some ideas for finishing your Shaker-style kitchen. While a traditional Shaker kitchen was unpainted, you can bring your kitchen into the 21st century by finishing it in some deep, bold colours. Finish your cabinets in black or navy for a dramatic kitchen. Or, invert the look with dark countertops and light grey shaker kitchen door fronts. Add some warmth and contrast with light wood, wicker, and brass. Honour the original principles of the style with a shaker style oak kitchen. If you don’t like oak, choose another natural wood like maple, pine, cherry or walnut. If you want a white shaker style kitchen then choose solid wood tops to match white shaker cabinets for a beautiful country-style interior. Even though it’s very traditional, the Shaker kitchen cabinet style is equally at home in a modern kitchen. Wrap-around solid surface countertops are a sleek way to add a modern touch to your kitchen. You can also add white shaker kitchen doors to the upper cabinets to contrast with darker lower cabinets for a two-tone look. A cream gloss shaker kitchen is the perfect ode to the modern style of the 1950’s. Contemporary shaker kitchen cabinets with glass add an edgy twist to the beloved classic. Or, spruce up the basic form with cream Shaker style kitchen cabinets and a contrasting contemporary countertop. The minimalist kitchen is a great option for most design styles but there are a few that pair exceptional well with the unadorned look. Complement one of the Shaker kitchen cabinet door finishes with an interior style that matches the modest aesthetic. Filled with natural elements and minimalist furniture, Scandinavian style has become a firm favourite in the interior design community. The blond wood of a typical Scandinavian home is the perfect canvas for white wood Shaker kitchen cabinets and a matching small white Shaker kitchen pantry. On the forefront of Nordic-inspired shaker kitchens, IKEA is one of many companies that cater to those who prefer fuss-free furniture. A kitchen is such a versatile space, especially when its design is unpretentious because it can fit any interior style. An industrial Shaker style kitchen is one such example. Keep the cabinet base in natural wood and add an industrial touch with steel countertops and a complementary extractor fan. Finally, soften the look with pastel countertop accessories and greeneral. Mid-century modern furniture is still a firm favourite in homes around the globe, but it has undergone a contemporary makeover. Now, a contemporary shaker style kitchen can accompany the most modern interior to transform it into a super trendy cooking zone. Pair a cottage style interior with a farmhouse kitchen and Shaker cabinets. The addition of a Shaker style kitchen island is ideal when cooking big family meals and to show off beautiful fresh flowers or fruit. Open shelving with both useful and decorative items on display is a great way to add some interest and colour to your kitchen. 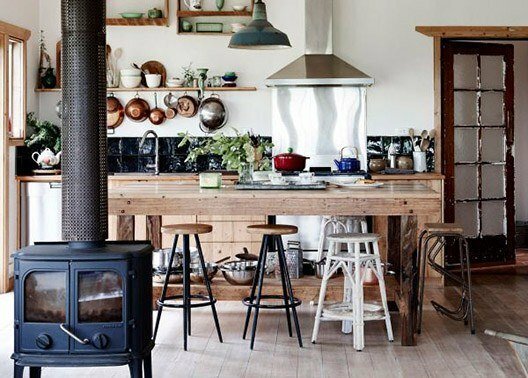 Choose items in natural materials like ceramics and copper to complement the style. A Shaker kitchen island is another easy way to display items that are used often in a kitchen; salt and pepper shakers in beautiful containers are great examples. Click here for more Shaker style kitchen photos or get in touch with us today! We’d certainly love to help you create your Shaker kitchen. Contact our consultants or visit one of our showrooms to chat with us about your perfect kitchen!